Earlier in the week, Boston coach Bruce Cassidy said teams "could be" playing more physical against his more skilled players with a pair of bigger defensemen - Zdeno Chara and Kevan Miller - sidelined by injuries. They seemed to respond. "That's how we were going to win tonight," Bruins defenseman Torey Krug said. "We had that edge and I think it brought a lot to the table. You look at our lineup and I think that's what we need right now. We're bringing that to the table. We need that to win." 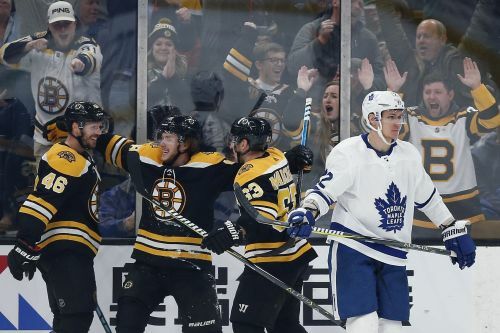 The game became more heated after Boston defenseman Charlie McAvoy took what the Bruins felt was a late hit by Zach Hyman midway into the third. McAvoy missed 20 games with a concussion before returning earlier this week. "You hate to see that," said teammate Matt Grzelcyk, who fought with Hyman. "Hopefully Charlie's okay." "That's hockey, and it's our job to respond to that," Matthews said. "Obviously they made a push back and we didn't respond." Less than a minute after McAvoy hit the post — Boston's second shot off iron in about a 3 1/2-minute span — Brad Marchand set up Backes in the slot, where he fired a rising shot past Andersen's glove and inside the right post for a power-play goal at 8:54. Krug's first goal first of the season made it 3-0 just under nine minutes later. After a flurry of chances, he scored on a wrister from the left point. Toronto has allowed 11 total goals in its last two games. "We talked about the importance of defending. It's just going out there and executing," center John Tavares said. "It's difficult to do it over 82 games. There's adversity you face." NOTES: Cassidy was hoping a little Christmas cheer could help his struggling team. On Friday, they did their annual charity toy-shopping spree to be delivered to children hospitalized locally. "It's no fun when you're not winning," he said after the morning skate. "We had a day off yesterday to do some shopping for the kids, if that doesn't get you in a good mood." ... Gemel Smith, acquired off waivers from Dallas on Thursday, made his Bruins debut. He wore No. 28. "I was just looking for more of an opportunity," he said Saturday morning of being let go by the Stars. ... The teams' final regular season meeting of the season is Jan. 12 in Toronto. ... Krejci has 592 career points. Neely had 590.